A disabled man from Cornwall is celebrating after being told he can now take his folding disability buggy on First Great Western (FGW) trains. Last month FGW told Rupert Armstrong Evans he could not travel because his buggy was not classed as a wheelchair. He complained to the company, describing FGW's disability policy as ridiculous and discriminatory. 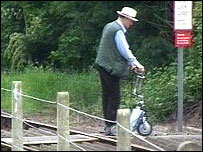 Mr Armstrong Evans said he was delighted FGW had changed its rules. The new policy starts later this month. FGW had initially defended its policy, saying the Disability Discrimination Act required it to have a clear policy on travel for people with disabilities. It claimed because of the different types and sizes of buggies it was hard to define what was or was not safe. But when Mr Armstrong said his buggy complied with all the rules for wheelchairs, which are allowed on First Great Western trains, the company reviewed its policy.